Powerful outside groups run by former Rep. Gabrielle Giffords and New York Mayor Michael Bloomberg are bankrolling ads and vowing to dump huge resources into the state to force Ayotte to reverse her opposition to the bill or pay the political consequences. And after two years of projecting a profile as a foreign policy and deficit hawk, her critics in the state have spent the past two weeks trying to rebrand her as: “NRAyotte. 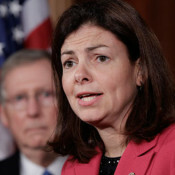 Kelly Ayotte on defense over gun vote – Manu Raju – POLITICO.com.